I went fishing to one of my all-time favorite places recently, Lake Kabetogama in the Voyageur’s National Park in northern Minnesota. I’ve been to Kab many times in the past fifteen years. I go there for several reasons, but mostly because it’s a world class fishery for a variety of fish. Usually our focus is on the fishing, and on this trip we were going to take our fishing seriously, but maybe not as seriously as we usually do. Here’s what I mean. I was going to be fishing with local angler Travis Carlson. Travis moved to Kab from Iowa a number of years ago: He and his family looked all over the Midwest for a place to buy a resort and to live. They decided that they wanted to live in the Kabetogama area more than anywhere else. Travis has a wife, a son Riley, and a daughter Jaeleigh. Travis had been working long days much of the summer, and the kids were getting ready to go back to school. Everyone decided that it would be a good idea if Riley and Jaeleigh joined Travis and me for a day of fishing. I’m glad they did. When we fish Kab, we usually target larger fish in deeper water. When you’re with youngsters or anyone who hasn’t been fishing very long, it’s important to target fish that want to get caught, and sometimes that means fishing in areas where there are more fish but maybe not the big ones. We started on a weedline and pulled Fire-Ball jigs tipped with minnows and live-bait rigs tipped with crawlers or leeches. We got bit almost immediately, and, for the next couple of hours, frequently. A good number of perch, walleyes, and sauger were calling this area home. Everyone in the boat was having a good time. Then the sun came out and the wind quit blowing into the area that we were fishing. The fishing action slowed considerably, so we moved to another area. When fishing slows due to bright skies or no wind, you need to move to another location. We moved to an area that had some wind blowing into it and the catching started all over, and the walleyes were bigger. On Kab they protect the walleyes with a slot limit. There are lots of eater ‘eyes, but also lots of big ones. We caught a few more fish, then realized we were hungry, and we did something we rarely do. We stopped for shorelunch. Usually when we’re fishing eating consists of gobbling down a sandwich as we move from one spot to another. On Kab there are lots of places that have fire pits to cook in. We found one and soon had a fire going. While the kids swam, Travis cleaned the fish and cooked them over the open fire. Then we ate walleyes that an hour ago were swimming in the lake. There’s just something about eating a shorelunch that makes the fish taste better. After eating, we tried another spot, caught a few more fish, and called it a day. It was an outstanding day. I doubt that I’ll do shorelunch again for a while, but it really was a nice change of pace from our usual fishing outings. It was also good to see kids take a sincere interest in being outside. We fished a full day and never once did I hear anyone say they wanted to go in or do something else. In my book, that’s a win. 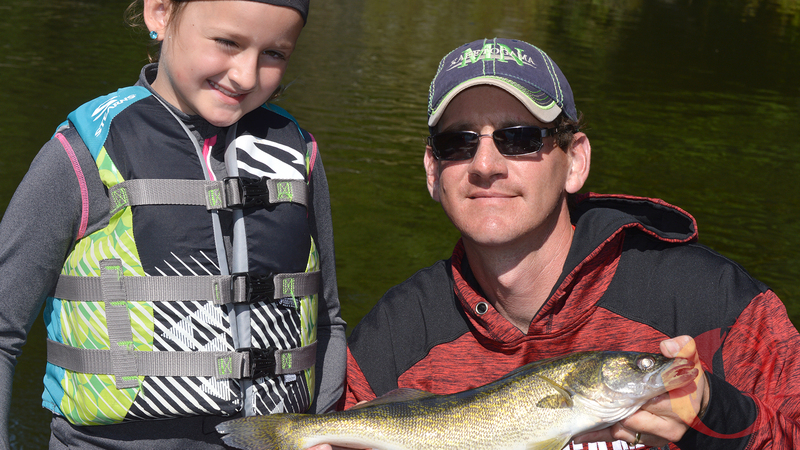 Photo: Travis and Riley Carlson with a nice walleye taken just before shorelunch. This walleye didn’t go to shorelunch with us: It was too big.